Last Sunday we attended a bbq filled with my husband’s extended family. Croquet was the before dinner entertainment and while I love the game, The game does not love me. We had a set growing up but my brother and I used the mallets more as threatening weapons than learning the intricacies of game play. That changed when I became involved with Cornelius. For his family, croquet is SERIOUS BUSINESS. Their expansive lawn with dips and valleys and hills and bushes as obstacles make for a challenging course. And Cornelius, his dad and everyone with a drop of related blood seems to go for the jugular. Did you think croquet was a civilized sport played only for fun? Think again. It’s cut throat and cruel…and of course, super fun. I’m not as cut-throat as the rest of Cornelius’ family and I seem to lack that talent for aiming the ball, thus, I trailed behind. Still, I love the game even if Cornelius did win by a mile. I nursed my loss with a hot dog, coleslaw, and handfuls of fresh raspberries. After the bbq, I was gifted with a giant ice cream container filled with fresh raspberries from a distant cousin’s garden. A consolation prize for coming in last? I’ll take it. While I greedily snacked on all the raspberries I could handle, I figured that something needed to be done with the soggier berries near the bottom of the container. Let me introduce you to these lovely raspberry breakfast bars. Spelt flour, almond flour (aka almond meal aka ground almond), brown sugar and oats act as the base and the crumble. Toasted coconut, vanilla extract, and warm spices like nutmeg and cinnamon tag along for the ride. Coconut oil and egg bind it all together while the fresh raspberries are unsweetened, save for a thin smear of raspberry jam along the bottom crust. These are totally easy bars to put together. 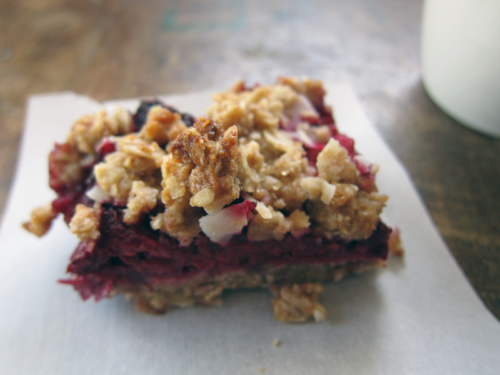 Make them in the evening, refrigerate them overnight and Ta-Da, you have sweet and fruity breakfast bars come morning! 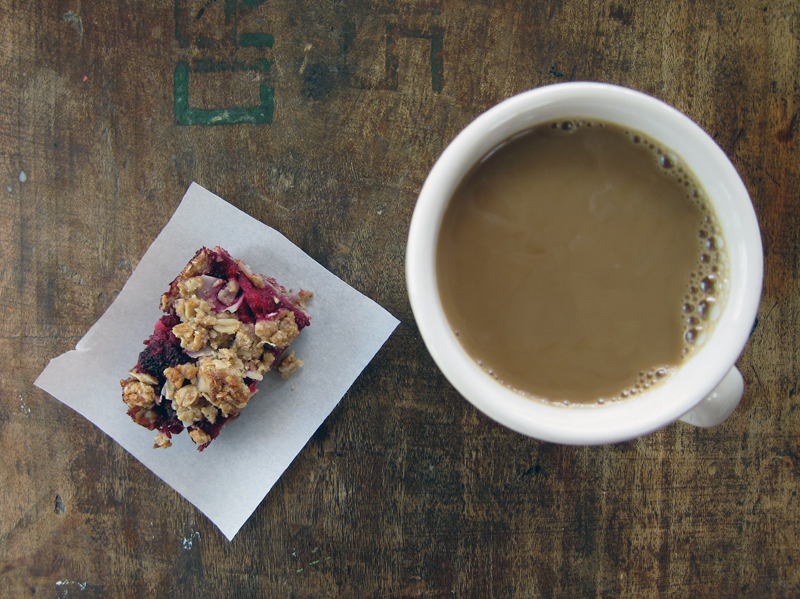 Have your morning cup ready and eat a square. They’re equally good in the evening too! I imagine that most summer berries would work well here, blackberries, tayberries and maybe even blueberries. If you try another berry version, leave a comment & let me know how it went. Also, while I liked the cinnamon & nutmeg, I think cardamom would have been a nice addition. I should also point out that you can sub regular all-purpose flour for the spelt & almond flour, make it whole wheat if you like! Preheat oven to 350F. 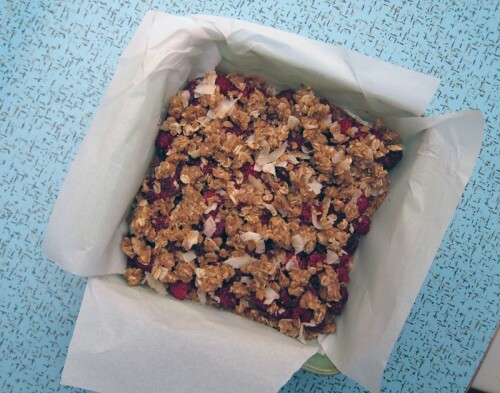 In an 8×8 glass pan, make a “sling” out of 2 sheets of parchment paper, so the paper overhangs over each edge. This will make it easy to remove the bars once they come out of the oven. 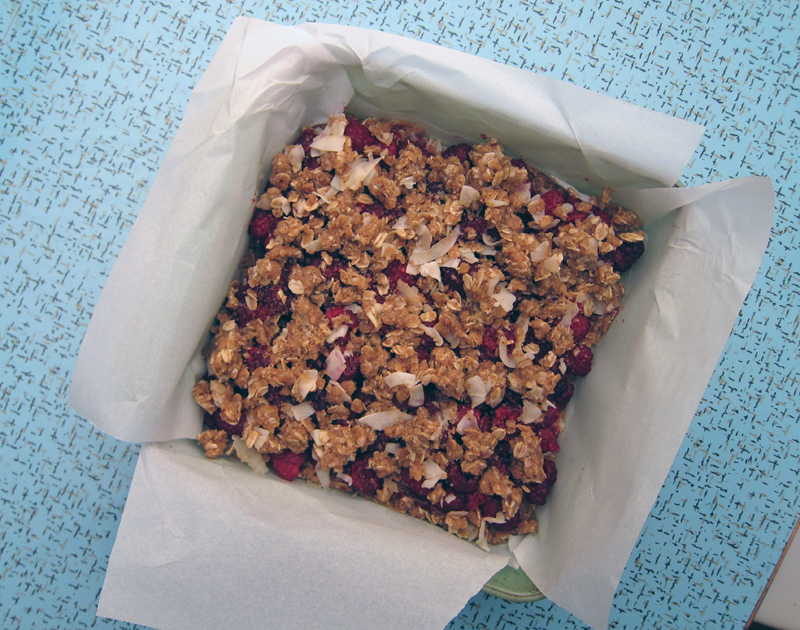 In a large bowl, combine the flour, oats, almond meal, coconut flakes, sugar, cinnamon, nutmeg and salt together. Add in the oil, egg and vanilla and stir until a crumbly dough forms. Set aside 3/4 cup of dough and then firmly press the rest of the dough into the prepared pan. Thinly spread the raspberry jam overtop the dough and then top with raspberries. Sprinkle the reserved dough over top and scatter raw sugar if using. Bake for 30-40 minutes or until golden. Let cool on a wire rack for 20 minutes and then use the sling to remove the bars from the pan and cool completely before cutting into squares. Refrigerate. I’d take those bars over a croquet win any day! That tub of raspberries was the real prize. I think we had a croquet set in the garage and also used the mallets more as weapons, ha. I don’t think I’ve ever properly played the game! Totally digging these! What a fun, summer, bar! I would take a big bowl of raspberries over a croquet win! And these bars, consequently. So good! These look fab, and bonus that they’re pretty healthy too 🙂 I’ve finished my freezer supply of raspberris but still have a load of blackberries to use, which I’m sure will be perfect in these bars. Ah croquet…I’ve never been a fan but it’s pretty much obligatory playing after exams at my university! those look great and healthy too. which of course means one can eat more – right? unfortunately raspberry season is over here but i’m thinking it would work just as well with blackberries and peaches and probably going w/ cardamom with at least the later. Do you really need the jam? it is not something use and really don’t want to have to purchase for such a small amount. but I wonder if it doesn’t seal the bottom crust from the juice of the berries and helps prevent a soggy crust. Argh! Can’t wait to start using my oven again. These look so tempting and I have 2 tubs of raspberries in the freezer to be used. Yum! 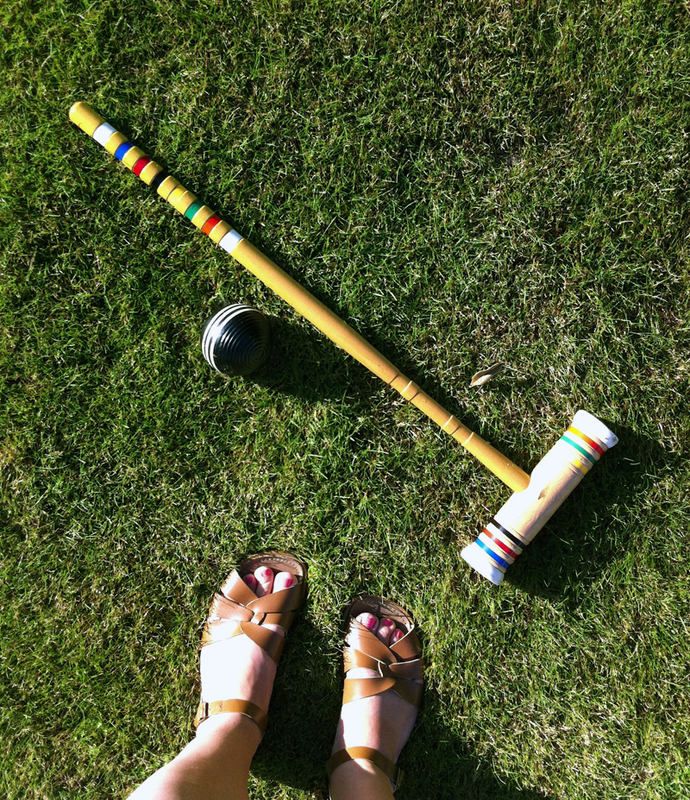 Wow, I love the idea of croquet after exams – stress reliever!! And I think these would be great with blackberries! Jacquie, I think you can skip the jam and be fine. Let me know how it goes – I second the peaches idea! Kickpleat, today with the humidex it felt like 45C. It’s hotter in the house in the evenings than out on the street. Our house retains a lot of the daytime heat. We’ve got 2 ceiling fans going all day long but no A/C. So no oven usage for a while. Joanne, yikes!! Though I do remember what Ontario summers were like. Hot n’ sweaty. We don’t even have humidex readings out here (Cornelius doesn’t even know what that means – he thought I made up the word when I first told him about it!). Stay cool!! Drink some iced tea! Haha! I wish the word “humidex” was an urban myth 🙂 Yes, I made a pitcher of iced tea yesterday and I need to make more as it’s almost gone. I’ve been going to local swimming pools to stay cool except you can’t really swim as it’s packed with families. The city has been issued an extreme heat alert. We’re expecting lower temps (28C) on Saturday and Sunday(24C). I just made them, using mostly blueberries, a few raspberries, and strawberry jam spread on the crust. I also swapped out five spice powder for the cinnamon and nutmeg. They’re fabulous! Made these tonight and they were delicious! 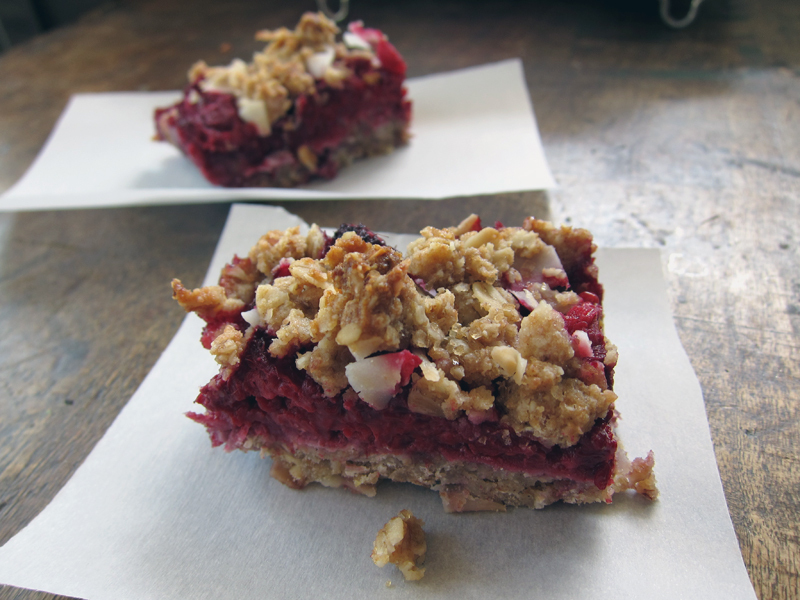 I used all white whole wheat flour instead of the almond and spelt and also used frozen red raspberries. Turned out great. Now to keep myself from eating the whole pan! Thanks Stephanie, I hope you loved them as much as we did! I love that you tried blueberries, hope it went well! Nice, Kat – I saw your photo on instagram & they looked great. Nice add with the 5-spice powder! Paula, I’m glad they worked with frozen berries too! Hooray! Hi! 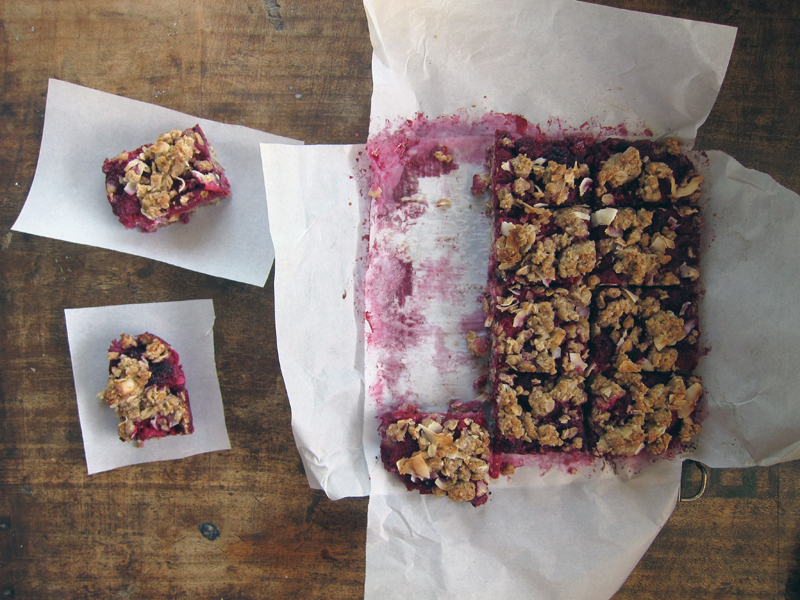 I made these these bars this afternoon with blueberries and strawberry jam on the crust and they are just delightful. Chewy, just the right amount of tartness, perfect all around. Thanks for the recipe, Jeannette! These look delicious! I love raspberries and always keep some in the freezer when they aren’t in season, so I think I may have to give this a try over the weekend! Jen, I saw your photos!! They looked great and I’m so glad you tried them with blueberries and declared them a success. Caz, gooseberries sound so good! I’d love to try that here 🙂 In fact, I’d just love to find gooseberries that aren’t so expensive because I’d totally eat them up! It looks awesome & easy to make, the recipe is so simple.